As of this writing, the hamburger has yet to be presented, although I doubt that means the plan has been abandoned. The article also pointed out that London’s Royal Society had released a global food supply report, in which they called for a synthetic meat solution to feed the world’s growing population without causing environmental destruction. “The only barriers? Overcoming the social stigma and the RS scientists say it could take another decade before it rolls out to the masses,” the article states. “Dr. Post’s cultures, grown from stem cells, are sheets 3cm long, 1.5cm wide and half a millimeter deep. To make the world’s most expensive hamburger 3,000 of them will be needed. The stem cells themselves are extracted from cattle muscle and then multiplied a millionfold before they are put in Petri dishes and allowed to turn into muscle cells. When they have done so, they are encouraged to exercise and build up their strength by being given their own gym equipment (pieces of Velcro to which they can anchor themselves in order to stretch and relax spontaneously). The fatty cells of adipose tissue, needed for juiciness, are grown separately and then combined with the muscle cells before the whole thing is cooked. I sincerely doubt bioengineered meat would be advertised, since it’s hardly a selling point—at least in the beginning. What the potential health ramifications might be from eating such meats are completely unknown, but it’s clearly not going to be identical to meat from an animal. Seeing how commercially available bioengineered meat is still a ways away from being a reality you have to contend with, let’s bring the focus back to something more relevant to the present day, namely antibiotics in CAFO meats. Animals are often fed antibiotics at low doses for disease prevention and growth promotion. These agricultural uses account for about 80 percent of all antibiotic use in the US,5 so it’s a MAJOR source of human antibiotic consumption. 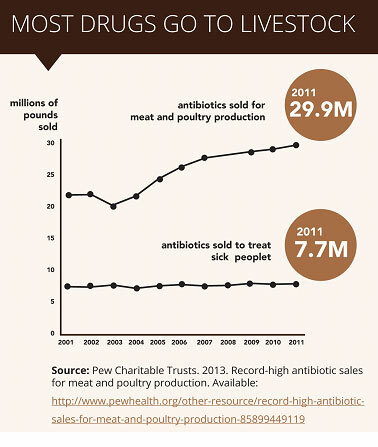 The misuse of antibiotics in livestock has now become “a direct source of foodborne illness,” EWG points out. Worse yet, because animals are given these antibiotics continuously, in low doses, pathogens are becoming increasingly resistant to the drugs, which means they no longer work to treat human disease either. The end result is that people are dying from infections that were once easily treatable. Despite this, organic foods, which are by law produced without such pathogen-promoting methods, are the ones being consistently targeted “for safety reasons.” The truth of the matter is, conventionally grown mass-produced foods pose the greatest danger to your health, in multiple ways, and are the ones to be avoided if you’re at all concerned about food safety. One of the best ways to avoid contaminated meat is to avoid meat from animals raised in confined animal feeding operations (CAFOs), aka “factory farms,” and buying organic, pastured or grass-fed meats instead. Growth promoters such as antibiotics are not permitted in organic animal farming, and organically-raised animals are also healthier as a result of being pastured, so overall you’re getting far “cleaner,” healthier meat. When it comes to chicken, there are a number of designations floating around, such as “organic,” “free-range,” “pastured” and “cage-free.” But while you may think these are interchangeable, they’re actually not. In many ways these labels are little more than creative advertising. The definitions of “free-range” are such that the commercial egg industry can run industrial farm egg laying facilities and still call them “free-range” eggs, despite the fact that the birds’ foraging conditions are far from what you’d call natural. For example, regulations on the use of the term “free-range” do not specify the amount of time the hens must spend outdoors or the amount of outdoor space each hen must have access to. Nor do they indicate that the hen must have access to a pasture diet. True free-range hens (and eggs), now increasingly referred to as “pasture-raised,” are from hens that roam freely outdoors on a pasture where they can forage for their natural diet, which includes seeds, green plants, insects, and worms. Large commercial egg facilities typically house tens of thousands of hens and can even go up to hundreds of thousands of hens. Obviously they cannot allow all of them to forage freely. They can still be called “cage-free” or “free-range” though, if they’re not confined to an individual cage. But these labels say nothing about the conditions they ARE raised in, which are still deplorable. So, while flimsy definitions of “free range” and “cage-free” allow such facilities to sell their products as free range, please beware that a hen that is let outside into a barren lot for mere minutes a day, and is fed a diet of corn, soy, cottonseed meals and synthetic additives is NOT a free-range hen, and simply will not produce the same quality meat and/or eggs as its foraging counterpart. So to summarize, what you’re really looking for is chicken and eggs that are both certified organic and true pasture-raised. Barring organic certification, which is cost-prohibitive for many small farmers, you could just make sure the farmer raises his chickens according to organic, free-range standards, allowing his flock to forage freely for their natural diet, and aren’t fed antibiotics, corn and soy. Last year, I visited Joel Salatin at his Polyface farm in Virginia.